Editor's note: This article is not meant as a substitute for professional legal advice. It is simply a reminder that private investigators can make dumpster diving a less risky part of the job by arming themselves with relevant legal knowledge. Although it's not the most glamorous part of a private investigators job, sifting through trash (a.k.a. dumpster diving) can turn up game-changing information. The credit card receipts, photographs, letters and other materials potentially obtained from trash receptacles may be just what you need to solidify a case. Accessing this trash/treasure isn't always easy or possible. The growing risk of identity theft has led to stricter laws in some areas, which makes things more difficult for private investigators. Investigators who recover trash in violation of local rules could be at risk of having to defend themselves against trespassing or theft charges. In order to protect yourself legally, conducting research about the area in which you're considering dumpster diving could save you from costly court battles later on. 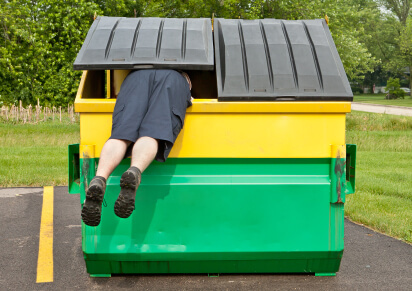 Here are a few things to look for when exploring whether dumpster diving is legal in your area. State and local laws regarding access to trash vary, so the first thing you need to do is learn what your local laws have to say. For example, the laws in your area covering dumpster diving could be so relaxed that you have free access to trash in most situations. Or the laws could define public areas more strictly than in other locations, which would affect your ability to dig through trash in areas such as street curbs or a dumpster next to an apartment building. And then you have places like Layton, Utah, where the city has banned dumpster diving entirely by imposing a city ordinance. Where the dumpster is located on the property can play a large part in whether the trash digging is deemed legal or not. If the trash is placed on the curb, its more likely to be considered in the public domain. If the trash container is right next to a house on a private driveway, your activities may be considered trespassing. Again, this distinction is entirely up to local laws. Collecting trash near an apartment building or other multi-unit living area is a situation that requires thought and knowledge of local laws. If the trash is located in a gated area of the complex, or in some other area not easily accessed by the public, you could be risking being accused of trespassing. It may be worth inquiring whether the trash collectors will cooperate with you during your investigation, or learning whether it makes a difference to the law if you received permission from the property owner before proceeding. The same rules regarding private property often apply to office buildings, so private investigators need to tread carefully in these areas. Over the years, businesses and organizations have become extremely sensitive to the threat of people stealing corporate trade secrets from the trash, and some courts have implemented legal measures to protect these organizations interests. If you're wondering whether it's legal to rummage through a trash container because its unlocked, its probably not okay. The legality of this depends more on the local laws and the location of the container than whether it is unlocked. As we stated at the beginning, keeping yourself informed is the best way to add dumpster diving to your services while also staying on the right side of the law. Discussing the law with a lawyer, your peers and your state association should give you a firm understanding of what is and isn't legal. If you have advice for effective dumpster diving, news about recent court cases concerning dumpster diving or even funny stories, feel free to visit PInow.com's LinkedIn group or Yahoo! group to share. Looking to grow your investigation firm? Get in front of potential customers by joining PInows trusted network of local, pre-screened private investigators.